Throwing a kids' Halloween party doesn't have to be expensive or elaborate. 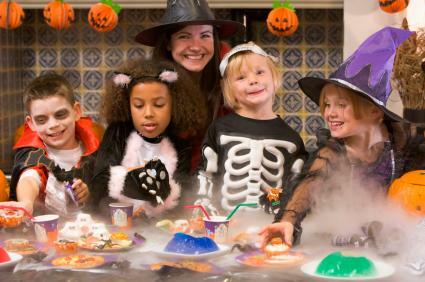 Linda Coulombe, National Children's Museum (NCM) Manager of Science Programs, shares some fun and cost-conscious Halloween party ideas for kids. LoveToKnow (LTK): What should parents keep in mind in selecting Halloween party ideas for kids? Linda Coulombe (LC): The most important thing to remember is to get children involved in the party planning. Start by asking them what kind of party they'd like to have. What are your child's interests? Dinosaurs? Princesses? Magic? Ask them to help make the decorations and build up anticipation. LC: Keep in mind when choosing a Halloween party theme, there is a big difference in the kind of theme party that will delight five year olds and those that will please the teen or pre-teen set. For example, there's a difference between "spooky scary" and "spooky funny." Especially with children six and under, keep the atmosphere and decorations more "silly spooky." For instance, you could use large hairy spiders for decorating and put a birthday party hat or a pair of eyeglasses on them. This helps younger kids get in the Halloween spirit without being uncomfortably scared. Aliens Halloween Party: Decorate the room with Christmas lights and lots of aluminum foil. You can also use old pie pans taped together and covered with aluminum foil to make your own mini alien spaceships. A Make Your Own Costume Halloween Party: Make your own masks. Cut out shapes of masks with white poster paper and have kids decorate them. Then let children make their own costumes. Put out old hats, funny clothes, old shoes, cardboard boxes, tiaras, hunting hats, and lots of brightly colored fabric remnants, costume jewelry, etc. Send kids home with photos of their costumes. LTK: What are some of your personal favorite things to include in a kids' Halloween party? LC: A spooky story time is a classic idea. Gather the children in a fun and "spooky" place like a tent set up in the living room. Light the inside with glowsticks or Coleman lamps, and read a "silly spooky" story for the younger kids and something with a scarier "ghost in the dark" feel for the older kids. Play fun "spooky" music that the kids can dance to, like the "Monster Mash." Children can decorate mini pumpkins with sticker faces. Glowsticks can be used for decorations and for the kids to carry. Have fun with a cauldron filled with items for the kids to pull out blindfolded, such as spaghetti, peeled grapes, slimy balls, etc. Decorate with lots of spider webs, especially around doorways so the kids need to walk through them. LTK: Do you have any ideas for fun Halloween party foods that kids will love to eat? LC: Mix "alien blue" punch with blinking, glowing ice cubes in each child's glass. Make a graveyard cake that kids can help decorate. Bake a chocolate cake in a rectangular pan and have the kids help decorate the top to look like a graveyard. Use Oreo cookie crumbs for dirt, gummy worms for worms, Milano cookies for gravestones, and Peeps for ghosts.Cook a Halloween pumpkin pizza. Shape the pizza dough in a pumpkin shape. Decorate with a pumpkin face using green pepper strips for eyebrows, black olives for eyes, and top with grated cheddar cheese. Create mummy-wrapped hot dogs. Use crescent roll dough strips and wrap around a hot dog. Bake at 375° for 15 minutes. LTK: Could you share some suggestions for party games and activities that will hold kids' attention without costing a lot of money? LC: Buy UV color changing beads and a handheld UV light, and let kids create their own glow-in-the-dark jewelry. These change from white to all colors when put out in sunlight or under a UV light. Play the spider web game. Make a spider web of yarn in the middle of a room. Wind a long strand of yarn for each child around and through the web. One end has a card with each child's name and the other end has a prize. Children need to go over, under, and through the web to reach their prize. Another idea is to make cute spiders out of sections of egg cartons. Use pipe cleaners for legs and googly eyes. LTK: What are some cost-conscious ways to create a spooky atmosphere at a kids' Halloween party? Make spooky ghosts during the party. Use dry ice, a real favorite and very cheap. It can be purchased from a beverage store or ice company. Create "spooky" fog by putting pieces of dry ice in warm water. Remember not to breathe the fumes and keep the dry ice away from little hands. Create a "spider's egg" out of a white balloon. Buy dollar store mini spiders and attach them to segments of fishing line. Tape onto the balloon and tape some spiders onto the balloon surface. Hang the balloon from the ceiling. 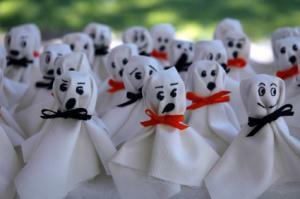 Craft "mini ghosts" out of Tootsie Pops wrapped in white fabric scraps or tissue. Cinch the material with a rubber band to create your ghost's head. Make funny ghost faces with black markers. Paint real pumpkins with glow-in-the-dark paint. Make milk jug ghosts. Use gallon milk containers and draw on faces with black Sharpies. Light the inside of the ghosts by cutting a small hole in the back for a mini flashlight or by dropping a glowstick or two inside. Working at the National Chidren's Museum since October 2000, Linda specializes in science, health and nutrition, crafts, and hands-on activities, as well as exhibit development. Linda holds a Bachelor of Science in biology from the University of Detroit and a Master of Science in biology from San Diego State University. With past experience as an elementary teacher, she has a deep-rooted interest in connecting kids and their families to science in fun, creative ways. You can learn learn more about the National Children's Museum and its program by visiting the museum's website.